In Part 1 we took a look at the incentives involved in Bitcoin mining and how they are used guarantee a single transaction history needed to prevent bitcoins from being double spent. In this post we will take more a technical look at the cryptography involved and how it is used to secure the network. As I said previously, Bitcoin is very accessible. While we will be discussing cryptographic concepts, it shouldn’t discourage you from continuing further. Before moving forward we should take a moment to learn about hash functions since they are used all throughout the Bitcoin protocol. To put it simply, a hash function is just a mathematical algorithm that takes an input and turns it into an output. For example, suppose we have an algorithm which just adds all the digits in the input string together. If our input is 1234 we would get an output of 10. Simple enough. However, there are certain properties of really good hash functions that make them suitable to use in cryptography. Keep these properties in mind as they are vital to the operation of the Bitcoin protocol. It should be very easy to compute an output for any given input, however it should be impossible (given current knowledge of mathematics and the state of computers) to compute the input for a given output even while knowing the mathematical algorithm. Consider, in the above example we can easily compute an output of 10 given the input of 1234, however going in reverse isn’t as easy. In this case there are many possible inputs that could add up to 10 (55, 136, 7111, etc). However, given the simplicity of our function one could still figure out the input relatively easily. Some cryptographic hash functions, on the other hand, are said to be unbreakable by even quantum computers. Unlike our example, each potential output should map to only one input. If a two different inputs can produce the same output this is called a hash collision. Good cryptographic hash algorithms are resistant to such collisions. The output should be the same length regardless of whether the input has 10 characters or 10 thousand characters. Bitcoin makes heavy use of the cryptographic hash function SHA256, which stands for Secure Hash Algorithm 256-bit. Incidentally, the SHA algorithms were originally developed by the NSA. You might wonder how we can trust something that came from the NSA. That’s certainly cause to be suspicious, however, the algorithms are part of the public domain and have been vetted and analyzed by cryptographers who know what they’re doing. The consensus is that they are secure. Now that we have the preliminaries out of the way we can start focusing in on the protocol. If you read Part 1 you will recall that all Bitcoin transactions are relayed to each of the peers in the network. Miners collect these transactions, perform a number of checks to make sure they’re valid, then add them to their memory pool. It’s at this point that they begin the process of creating a block. 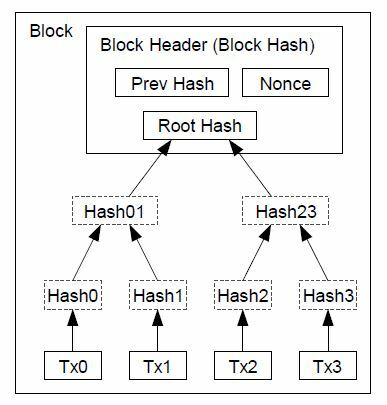 These hashes are then organized into something called a Merkle Tree or hash tree. If you’re familiar with what an NCAA tournament bracket looks like, you’ll understand this concept. The hashes of the transactions are organized into pairs of twos, concatenated together, then hashed again. The same is done to each set of outputs until something like a tree is formed (or an NCAA bracket). In the above example there are only four transactions (tx stands for transaction). A real block will contain hundreds of transactions so the bracket (tree) will be much larger. The hash at the very top of the tree is called the Merkle Root. By the way, don’t worry if you don’t yet understand why transactions are organized into a Merkle tree, we’ll bring it all together soon enough and then it will all “click”. The block’s header is then hashed with SHA256 producing an output that will serve as the block’s identifier. Now having done all this can we go ahead and relay the block to the rest of the network? If you recall the last post, the answer is no. We still need to produce a valid proof of work. Any block whose header does not produce a hash that is less than the target value will be rejected by the network. The target value is adjusted by the protocol every two weeks to try to maintain an average block time of 10 minutes. So after you’ve hashed each transaction, hashed the outputs into a hash tree, found the Merkle Root, added it to the block header with the hash of the previous block and a nonce, hashed the header and produced an output that does not start with the correct number of zeros, then what? This is where the nonce comes in. The nonce is simply a random number that is added to the block header for no other reason than to give us something to increment in an attempt to produce a valid hash. If your first attempt at hashing the header produces an invalid hash, you just add one to the nonce and rehash the header then check to see if that hash is valid. For example, suppose we wanted to hash “Hello, world!” such that the output started with at least three zeros. You would concatenate it with a nonce, hash it and check the output to see if it’s valid. If it isn’t, you add one to the nonce and try again. In this example it took 4,251 tries to find a nonce such that when concatenated with “Hello, world!” produced an output starting with at least three zeros. This is Bitcoin mining in a nutshell. Notice the entire block of transactions isn’t rehashed with every attempt, just the header. This is essentially what Bitcoin mining is, just rehashing the block header, over, and over, and over, and over, until one miner in the network eventually produces a valid hash. When he does, he relays the block to the rest of the network. All other miners check his work and make sure it’s valid. If so, they add the block to their local copy of the block chain and move on to finding the next block. In the old days miners just performed the SHA256 calculations on their laptop’s CPU. However, the more hashes that you can perform per second, the greater the probability that you will mine a block and earn the block reward. CPU mining quickly gave way to GPU mining (graphics processing units) which proved much more efficient at calculating hash functions. In todays world, miners are using ASICs (application specific integrated circuits) to mine Bitcoin. Basically, these are purpose built computer chips that are designed to perform SHA256 calculations and do nothing else. It’s not uncommon to see miners calculating over one trillion hashes per second (a terrahash). At present, the total hashing power in the network is about 700 terrahashs per second and closing in on one petahash per second. I should probably also note at this point that the first transaction in each block is referred to as the “coinbase” transaction. This is a transaction where the miner sends himself 25 bitcoins that have just been created “out of thin air”. Because each miner is sending these 25 bitcoins to his own address, the first transaction in each block will differ from miner to miner. Now remember the properties of a cryptographic hash function? If an input changes even in the slightest, the entire output changes. 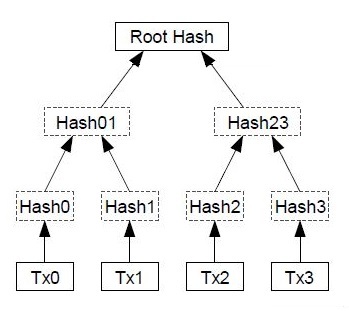 Since the hash of the coinbase transaction at the base of the hash tree is different for each miner, the entire hash tree including the Merkle root will be different for each miner. That means the nonce that is needed to produce a valid block will also be different for each miner. This is the reason why the Merkle tree is employed after all. The transactions are represented in the header by the Merkle Root so that the entire block of transactions doesn’t need to be rehashed with each attempt (which would make the amount of time needed to hash a block vary with the number of transactions). Any change to a single transaction will cause an avalanche up the hash tree that will ultimately cause the hash of the block to change. Now let’s see how this protects the network from attack. If an attacker wants to alter or remove a transaction that is already in the block chain, the alteration will cause the hash of the transaction to change and spark off changes all the way up the hash tree to the Merkle Root. Given the probabilities, it is unlikely a header with the new Merkle Root will produce a valid hash (the proof of work). Hence, the attacker will need to rehash the entire block header and spend a ton of time finding the correct nonce. But suppose he does this, can he just relay his fraudulent block to the network and hope that miners will replace the old block with his new one or, more realistically, that new users will download his fraudulent block? No. The reason is because the hash of each block is included in the header of the next block. If the attacker rehashes block number 100, this will cause the header of block 101 to change, requiring that block to be rehashed as well. A change to the hash of block 101 will cause the header of block 102 to change and so on all the way through the block chain. Any attempt to alter a transaction already in the block chain requires not only the rehashing of the block containing the transaction, but all other subsequent blocks as well. Depending on how deep in the chain the transaction is, it could take a single attacker weeks, months, or years, to rehash the rest of the block chain. And as I mentioned in Part 1, as long as the attacker does not control a majority of the processing power in the network, the rest of the network will be adding new blocks on to the main chain faster than the attacker can add blocks to his fraudulent chain, guaranteeing that the legitimate chain remains the longest and the attacker’s chain is ignored. The only exception to the above rule is if the attacker simply gets lucky. As we noted, it takes the entire network an average of 10 minutes to find a valid block. It should take a single attacker with, say, 10% of the processing power in the network 100 minutes to find a valid block (200 minutes at 5% etc), but those are just averages. It’s theoretically possible that an attacker could get lucky and mine a block in 1 minute when it’s supposed to take him an average of 100 minutes. If that block contained a double spend, it’s possible the attacker’s fraudulent transaction would get included in the block chain and his legitimate transaction rejected (the rest of the network would think the legitimate transaction is the double spend). The deeper a transaction is in the block chain, however, the more times in row the attacker would need to get lucky and mine a block before the rest of the network to extend his chain longer than the main chain. From a probability standpoint, the chances of such an attack succeeding decrease exponentially with each subsequent block. It’s kind of like winning the lottery a number of times in a row. In the original white paper Satoshi Nakamoto calculated the probabilities that an attacker could get lucky and pull off a double spend. In the following table q is the percentage of the network controlled by the attacker, P is the probability an attacker could get lucky and override z number of blocks. Given the above probabilities we can see that an attacker with 10% of the network’s processing power would have a .024% chance of getting lucky and overriding six blocks. Which is usually why it is recommended that if you are selling something expensive, you should wait until your transaction is six blocks deep (six confirmations in Bitcoin lingo) before actually handing over the merchandise. Ok that’s it for now. This post got long in a hurry. I was going talk a little bit about mining pools, but maybe I’ll save that for a Part 3. Hope you enjoyed these posts and I hope you learned something. Thank you very much for this informative post, chris. – A good hashing function should be collision free? – Logically, this only applies to inputs that have less bits than the output. – Otherwise one would have the world’s best compression function, where 1 gig could be compressed into 256 bits. – So because Bitcoin generally uses inputs larger than the outputs, it is in face NOT collision free. Wouldn’t that be a point where Bitcoin could be attacked using a quantum computer, or if ‘p vs np’ is solved? That’s a really good point. There are multiple private keys per bitcoin address, but it’s like a needle in a haystack. This comment from reddit gives the probabilities. I still think that is out of range of quantum search algorithms. You’re correct, it’s not actually collision-free, but practically we can think of it as such since there’s something like 2 ^130 possibilities, and so it’s extremely unlikely that, given the hash of a message, H(m), you’d be able in any reasonable amount of time to find another message, m1 such that H(m) = H(m1). Also, when it comes to bitcoin, with the entire network racing ahead, even if you did spend the time to find m1, you have to do that as many times as blocks you need to remake, and by that time the network is even further ahead, so unless you have more than 50% of the computing power, it’s a losing battle. Please link to Part 3. For the hash chaining, does it mean if somebody get one valid hash, I need to update and download it and re-calculate based on his block? Or can I make a new branch based on previous block? Thank you for being so detailed. The examples are great ! Bitcoin has seen rapid increases during the last year and there are now those who are claiming that the bubble is soon to burst and Bitcoin crumble. Those of us continue believe in the idea of a user owned system away from the reach of the banks. We do not believe that the currency is finished. We shall be staying with Bitcoin and I am quite confident that it will continue to rise more rapidly than before. What about when all the bitcoins are mined? Thanks Christian! We’re glad you enjoyed the post! Thanks for a great article. One thing I’m still not understanding is, since all block inputs are fixed for a given miner except the nonce (unique to each miner), wouldn’t it be fairly simple to quickly calculate the nonce that works for that individual miner (i.e., a quick function to start at zero and go up to ~4 billion)? How then does the miner broadcast that to the rest of the network to get consensus on the work if his nonce is unique from what another miner would have theoretically found? Excellent, concise explanation. Maybe add a footnote on derivation of “nonce” from “nones”, meaning “just for once”, used by Chaucer in Canterbury Tales. 1) I’m a little confused about the Validation of Transactions. The article writes: “Miners collect these transactions, perform a number of checks to make sure they’re valid, then add them to their memory pool”. What are the checks that they run? Do they go through the whole blockchain to see whether the Sender has enough to send the amount specified in the transaction to the Receiver? 2) From what I understand, the Blockchain maintains a set of ‘unimplemented transactions’, and Nodes are not notified when another transaction is made. They are only notified when a new block is formed. At which point, they: 1) stop work (since the Previous Hash will now point to the newly created block); 2) update the Previous Hash that they’re using in the block that they’re minining; 3) update the list of transactions in the block, by seeing which transactions have been added & removed from the Blockchain’s list; and then 4) get back to work. t=3: miner 1 finishes. miner 2 stops working, updates the Previous Header and transactions (which now == ) and continues work.